The mear profile of Super Spicy explains its class it's luxury it's roominess and its speed. A true model winner this boat does it all with comfort versatility and speed. Stepping into the cockpit the diamond non-skid in the swim platform sole shows that this boat was made safe. Some of the best non skid in the business it covers the entire swim platform the cockpit the cockpit steps and the other important main walk areas throughout the boat. The swim platform also offers an integrated hideaway swim ladder and a curved trunk to hide large fenders lines cleaning supplies the cockpit table and shore cords. Above the swim platform is the large u-shaped curved aft lounge. This lounge has large storage under each compartment and drink holders. The engine hatch compartment uses the aft back portion of the lounge as the hatch and is hydraulically lifted from a switch at the helm. You enter the cockpit from the port side swing door. Just outside that door is a hot/cold transom shower and water fill deck plate. Upon entering the cockpit the non skid floor is plushly lined with a custom cut rubber backed and bound tan berber carpet that sweeps the curves and lines of the cockpit rim The carpet also has cutouts for the removable cockpit table inserts. To port and just inside the cockpit door is a long curved cabinet that houses a large storage area and an icemaker and outdoor breaker panel. The icemaker area sits below and are shielded by two white plexi doors. Above this cabinet are two intergrated drink holders two sink areas one with a spigot and both with drains. Right next to the sinks and a hidden trash container and each opening is covered with a Corian countertop. The front border of this whole cabinet/locker is lined with a stainless steel grab rail. Forward of the sinks and icemaker is a settee that can either be used as a sun lounge due to its curved and padded head rest or will also seat 2 - 3 people while traveling or sitting or entertaining. Directly across from the settee is the helm area. The large helm area has a double wide seat with individual lift up bolsters. As with the rest of the cockpit upholstery the seat has attractive green and silver stripes through the all white upholstery. The helm dash has full VDO gauges zero effort controls decorative wood trim dash custom wood tilt steering wheel and array of electronics for maximum cruising which include chart plotter radar and autopilot. There is a molded three step intergrated walkthrough centerline of the windshield which opens up and has a SS handrail. The handrail attaches to the curved Taylor made windshield which ends aft on the sides where the reverse radar arch is located. The cockpit is covered with a six foot long aft green bimini and a three foot bimini forward of the radar arch. The forward deck has a wide centerline non-skid walkthrough to the windlass. The forward deck has stainless steel rails on both sides for safety and four hatches and four stainless steel cleats. Sliding the white plexi glass cabin door three steps down will put you into a very open and wide cabin. You will be amazed how much room you have in the cabin of this boat from what you might have thought by looking at its sleek exterior. As you head down the steps to port is a small closet stereo unit and an air conditioning vent. Next to that is the separate refrigerator and freezer that is all covered by the same veneer to match the galley trim and other wall coverings throughout the boat. The galley features a sand Corian countertop stainless steel sink Sharp microwave and plenty of storage. Forward and up a step is an extremely large v shaped lounge beautifully covered in tan leather. This area converts into a guest bed with filler cushions. The cabin is decorated very nicely with designer pillows and designer curtains. Under the v shaped couches are plenty of storage and the raised step houses the filler pieces for the transient guest bed. There is a designer mirror all the way forward and in front of that has a large storage area as well. To starboard at the end of the v shaped lounge is the electrical panel and above is a Quasar 13" color TV/VCR. Just aft of the TV is the enclosed head. The heads havestall showers SS sink corain counter top storage mirrors and a skirted shower stall. The master stateroom is the mid cabin and is located just aft of the head and tucked under the helm area. The master sleeps two comfortable with designer bedding and overhead lighting. 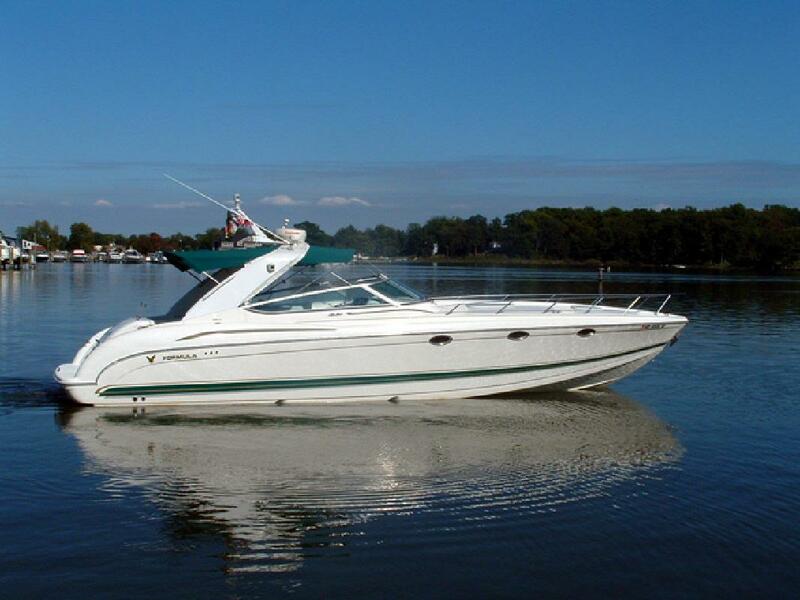 If you are in the market and looking for a fast sleek well known boat that is in excellent shape please review the rest of the details and call. The boat has no bottom paint and stays on a lift during the summer and inside during the winter. Easy to see and show. "Super Spicy" is a good looking fast easy boat to operate boat with all the comforts of home with a/c heat and galley amenities and equally important performance." Super Spicy" will open your eyes!